Congratulations! C/CMSgt Freeman earned his Solo Wings! 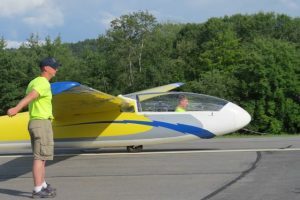 C/CMSgt Freeman earned his Solo Wings this summer at the National Flight Academy Northeast Region Glider Flight Academy in Springfield, VT.
C/SMSgt Moody also attended the Glider Academy, earning his Pre-Solo Wings. The glider flight academies teach all the basic to advanced skills and ground instruction that lead to a private glider rating. Cadets have the opportunity to Pre-Solo in their first Glider Academy and Solo in their second. To see what it’s like, watch this video from the 2015 Glider Academy.